Background & objectives: Insecticide applied at optimum dosage and coverage delays the development of resistance in disease vectors. The study was aimed to test the hypothesis whether decrease in exposure to insecticide leads to decrease in selection of insecticide resistance in mosquitoes. The mosquitoes were variably exposed to insecticide in the laboratory by simulating the variations in insecticide sprays applied in the field. Methods: The study was carried out on DDT resistant adults of Anopheles stephensi. Mosquitoes were differentially exposed to impregnated papers of DDT (4%), that were differentially masked to 25, 50, and 75% area with an unimpregnated Whatman No.1 filter paper, and to a positive control without any masking, i.e. 100% exposure area. The study was conducted for five generations and at each generation mosquitoes were exposed to differentially masked impregnated papers, and percent mortality was calculated. Results: The observed survival rate in differential exposures was more with the increase in heterozygous genotype resistance-susuceptible (RS) frequency. 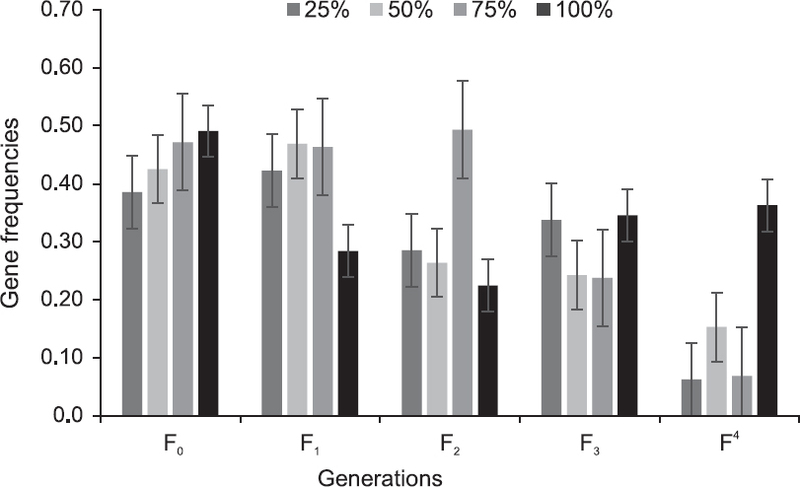 Resistant gene frequency with differential exposures (25 to 75%) was in the range of 0.38–0.54 for the F0 generation, which increased to 0.84–0.93 for the F4 generation. In 100% exposure it was 0.18 in F0 generation, which increased to 0.58 in the F4 generation. The resistant gene frequencies in the population showed increasing trend with decrease in exposure in contrast to complete exposure. Interpretation & conclusion: Variable simulated exposures resulted in precipitation of increased resistance while complete exposure resulted in lower levels of resistance, signifying the importance of optimum dosage and coverage in the indoor residual spray in delaying/avoiding the development of insecticide resistance in the disease vectors. Mosquitoes were differentially exposed to diagnostic dose impregnated papers of DDT (4%) in the laboratory using the WHO insecticide susceptibility tests as explained above. For this, mosquitoes were exposed to DDT impregnated papers that were differentially masked with unimpregnated Whatman No. 1 filter paper covering 25, 50 and 75% area, and to impregnated paper without any masking, i.e. 100% area exposed or unmasked DDT (4%) impregnated papers [Figure 1]. Unmasked DDT (4%) impregnated paper was considered as positive control to compare the effect due to differential exposures at each generation. The study was conducted for five generations, F0 to F4 and at each generation mosquitoes were exposed to differentially masked impregnated papers, and percent mortality was calculated and corrected as explained above. 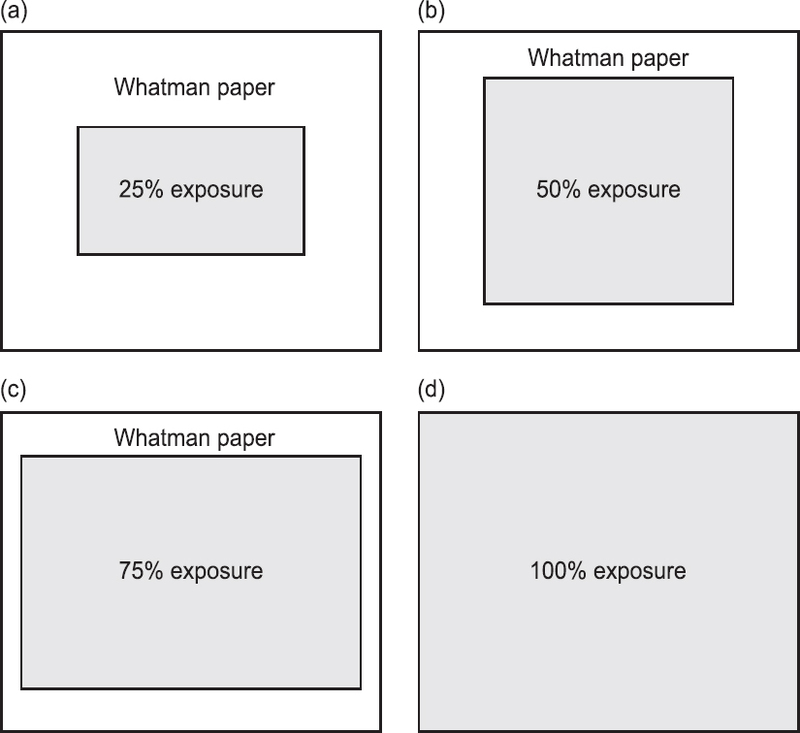 Figure 1: Illustration showing masking insecticide of impregnated papers with Whatman No. 1 filter paper to expose the mosquitoes: (a) 25%; (b) 50%; (c) 75%; and (d) 100% (0% masking positive control). The An. stephensi ListonGoa strain used in the study was 56% susceptible to DDT (4%). This line when exposed to differentially masked DDT (4%) impregnated papers (25, 50 and 75%) and to positive control, i.e. 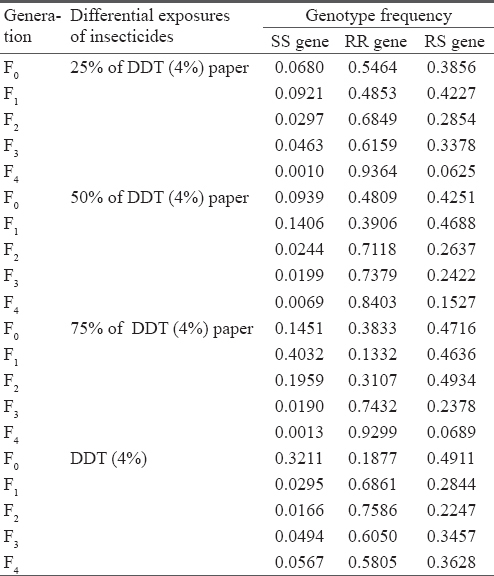 100% exposure to DDT (4%) impregnated paper for one and 24 h holding showed variable mortalities [Table 1]. The percent mortality registered in F0 generation was 26.1, 30.7, 38.1, respectively for 25, 50 and 75% exposure area against the observed 56% mortality in positive control (100% exposure area). It was observed that the percent mortality registered in F0 generation was ~2 times less than that in positive control and thus showed a trend of increase in mortality with respect to the area of exposure. In the later generations no trend was observed in the percent mortalities in the exposures. In the F4 generation, increase in resistance to DDT was observed in all the four exposure areas. Relatively lower mortality was observed in differential area exposures compared to 100% exposure area. For 100% exposure area it was 23.8% while for 25, 50 and 75% exposure area, it was 3.2, 8.3 and 3.6%, respectively. In positive control the percent mortality was 17.17 in F1 generation which was 3.3×less than that in the F0 generation (56.7%). In the F2 generation it decreased to 12.9%, but in F3 and F4 generation it increased to 22.2 and 23.8%, respectively. Similarly, the calculated LT50 values (min) in the respective exposures (25, 50 and 75%) decreased in the F4 generation and were respectively 111, 81 and 208 min, while for 100% exposure area it was 80.15 min. The frequency of SS, RR and RS genotypes calculated for each generation is shown in [Table 2]. The RS genotype frequencies in F0 generation in 25, 50 and 75% masked exposure areas were 0.3856, 0.4251 and 0.4716 which decreased to 0.0625, 0.1527 and 0.0689 in F4 generation. However, in positive control exposure, the RS genotype frequency was 0.4911 in F0 which decreased to 0.3628 by F4 generation, and thus the decrease was relatively lower than that in 25, 50 and 75% exposure area. The graphic representation of RS genotype frequency showed stability in resistance with 100% exposure, whereas in other exposures, the resistance increased, with concomitant decrease in RS genotype [Figure 2]. From these results it was clear that when the susceptible population is suppressed differentially (25, 50 and 75%), the frequency of RS genotype in the population decrease, and it is faster than in the population that was exposed to unmasked insecticide impregnated paper, i.e. positive control. Increase in the frequency of resistant gene (RR) was observed in the lower exposures (25 to 75%) ranging from 0.38–0.54 in the F0 generation to 0.84–0.93 in F4 generation; while in 100% exposure it was 0.58 in F4 generation in comparison to 0.18 in F0 generation. Thus, it was observed that the increase in frequency of resistance gene was relatively higher in lower exposures than in the complete exposure (100%). Figure 2: Calculated genotype frequencies of resistance-susceptible (RS) gene in different generations of An. stephensi to differential exposures to DDT (25, 50, 75 and 100% exposed). Georghiou GP, Taylor CE. Genetic and biological influences in the evolution of insecticide resistance. J Econ Entomol 1977; 70(3): 319–23. Georghiou GP, Taylor CE. Operational influences in the evolution of insecticide resistance. J Econ Entomol 1977; 70(5): 653–8. Prevention and management of insecticide resistance in vectors of public health importance, II edn. A manual produced by: Insecticide Resistance Action Committee 2011; p.72. Available from: http://www.irac-online.org/content/uploads/VM-Layoutv2.6_LR.pdf (Accessed on March 24, 2016). Taylor CE, Georghiou GP. Suppression of insecticide resistance by alteration of gene dominance and migration. J Econ Entomol 1979; 72(1): 11–6. Test procedures for insecticide resistance monitoring in malaria vectors, bioefficacy and persistence of insecticides on treated surfaces. Geneva: World Health Organization 1998. Available from: http://WHO/CDC/CPC/MAL/1998.12. (Accessed on March 24, 2016). Abbott WS. A method of computing the effectiveness of insecticide. J Econ Entomol 1925; 18(2): 265–7. Kothari CR. Research methodology methods and techniques. New Delhi: Wiley Eastern Limited 1988; p. 500. Curtis CF. Theoretical models of the use of insecticide mixtures for the management of resistance. Bull Entomol Res 1985; 75(2): 259–65. Raghavendra K, Verma V, Srivastava HC, Gunasekaran K, Sreehari U, Dash AP. Persistence of DDT, malathion and deltamethrin resistance in Anopheles culicifacies after their sequential withdrawal from indoor residual spraying in Surat district, India. Indian J Med Res 2010; 132: 260–4. May RM, Dobson AP. Population dynamics and the rate of evolution of pesticide resistance. Pesticide resistance: Strategies and tactics for management. Washington DC: National Academy Press 1986; p. 170–93. Hess AD. Chemical control of mosquitoes in the tropics. In: Proceedings and papers of the 23rd Annual Conference of the California Mosquito Control Association at Los Angeles from 24–27 January 1955; Edited by C. Donald Grant. California: California Mosquito Control Association, Inc 1955; p. 76. Taylor CE, Georghiou GP. Influence of pesticide persistence in the evolution of resistance. Environmental Entomol 1982; 11(3): 746–50.